Cate Gardner, Strange Men in Pinstripe Suits. Strange Publications, 2010. ISBN 9780982026649. $11.99. This is without doubt a most unusual collection of short stories. It’s nice when a writer finds a unique voice, and Cate Gardner has done just that with Strange Men in Pinstripe Suits. The book is a trade paperback edition, just short of 200 pages in length, with a rather monochrome cover that’s nevertheless still pleasing on the eye. Roughly half the stories are previously unpublished. The rest are reprints, but given Gardner’s fiction has graced the likes of Postscripts, Fantasy Magazine, Shock Totem and other professional venues, it’s clear a reprint is not something to sneer upon. I found the book available for purchase on the publisher’s website, and at Amazon.com, but it’s not currently available from Amazon.co.uk. This struck me as odd given that Gardner is an English author; whether this is an oversight, or if there is a reason for the omission, I’m not sure. Publisher Nathaniel Lambert, in his somewhat gushing introduction (well, he is selling the book!) says: “I’ve never read a collection like this. Plain and simple... each piece more original than the next.” Does the collection live up to the publisher’s hyperbole? The short answer is a resounding yes. The tales have a unique feel to them; it’s hard to imagine anyone else writing them quite like Gardner. Rhys Hughes can pop out an odd tale or two, but Gardner is Hughes and substance abuse. There’s certainly an element of bizarro fiction in these stories—the opening tale, the ultra short ‘Dandelion Fluff’, for example, is told from the point of view of a flower, so how bizarre is that? But unlike much of what I see in the world of bizarro, Gardner’s fiction is much more controlled. Yes, things happen at tangents to reality, and yes plotlines may leap off this way and that without warning, but still there’s always the feeling that there’s a strong grounding in the real world to these stories; there’s always an element of the everyday nearby to which we can cling. And that’s where the charm of this book lies—there are depths to these stories, sometimes subtle depths that need a second read, perhaps, but the underlying theme of each story is there to be delved for. The aforementioned ‘Dandelion Fluff’, for instance, at first glance might be perceived as somewhat trite. But scratch the surface, and the story is a poignant comment about ageing, decay and ultimately rejection. 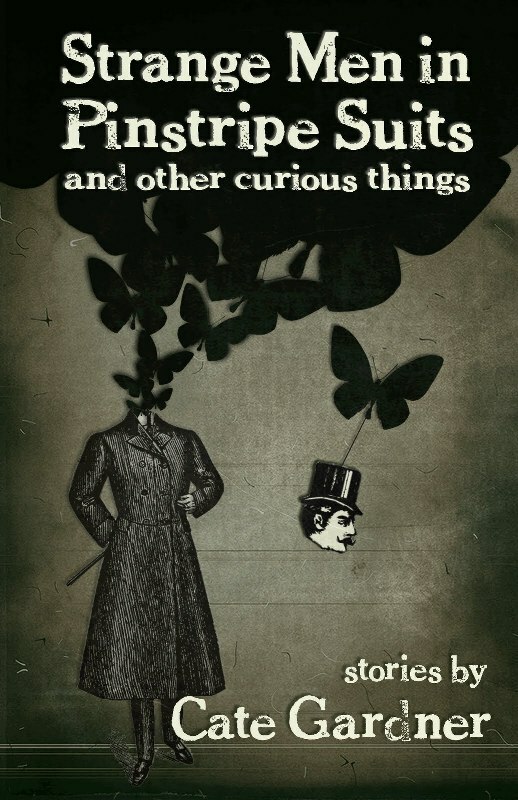 There are twenty-four amazingly titled stories in Strange Men in Pinstripe Suits, all of them deeply imaginative; all of them very short in length. Being so short makes this collection ideal to ‘dip in and out of’, for the morning commute or the snatched lunch break. Possibly a problem with such brevity is that at times I wanted Gardner to give me a bit more insight into the characters she’s created. In ‘Opheliac’, for example, I was mesmerised by this man who lives at the bottom of a canal collecting shopping trolleys and dead girls wedged under ledges and stones. A wonderful character, I felt, one to explore and expand upon, and in a highly unusual setting too, but all too soon I felt drawn away to an ending that whilst imaginative seems rushed and doesn’t do him justice. I felt there were times in other stories, too, that I wanted Gardner to slow down a little and let me breathe, let me wallow in the story for a moment, for her not to try so hard for the ‘clever’ shift in events. Of course, were she to do so, one could argue this would be a far different collection of stories. And there are more: ‘Cold Coffee Cups and Curious Things’—a tale of confused isolation and the lack of control in apparent imprisonment—and the marvellous ‘Trench Foot’ are just two of the stories that caught my attention. In many ways, these two stories show how Strange Men in Pinstripe Suits is a collection of extremes—‘Cold Coffee Cups’ is populated by human characters generally doing human things, and whilst events are eerie and odd, it’s still a story we can easily relate to; but ‘Trench Foot’ is full of fairies and strange characters, and talks of war between the fairies and the robot swarm, and generally pounds on the reader’s senses. In a good way, of course. It means nothing is predictable in this collection. In ‘The Sulphurous Clouds of Lucifer Matches’ we have the story of Molly, bought and sold by three witches at the ‘sell your child’ market for a ‘box of matches and an apple’. This has the feel of a classic fairy story, complete with allegorical ending. But it’s distinctly Gardner-esque in execution, as Molly must fight against terrible abuse to take revenge against the witches and make the world a better place for all in general. But I think Gardner saves the best tale until last. ‘Empty Box Motel’ tells the poignant story of Hannah, a young girl who is dying. Gardner shows great skill in writing such emotion into so short a tale. And even with imminent death we are shown hope: “I’m going to fly as far up in the sky as possible and not allow the undertakers to catch me.” I suppose that’s all any of us can ultimately hope for in life. As a whole, I didn’t feel a strong ongoing theme running through the collection. Possibly I could suggest the theme is ‘misfit’, or maybe ‘loss’, as many of the characters, good and bad, appear awkward with their lot. But then, given we’re talking genres here of horror/bizarro/fantasy/slipstream (how many more can I add? ), my suggestion is such a theme would be a given anyway. Instead, I see these stories to be enjoyed for their individuality—read, enjoy, and move on to the next—without delving too deeply for Gardner’s master plan. Either that or Gardner is intent on conquering the world by letting loose chaos. But the collection works because there is the simple delight of not knowing where the reader will be taken next. It’s a wild ride, and the book should come with seat belts. It works because Gardner’s imagination is a very strange world indeed. It works because as a writer Gardner is most certainly skilled at showing us the chaotic but deftly pulling us back from the brink when necessary. So, a very enjoyable experience reading Strange Men in Pinstripe Suits, and if Aunt Mildred has slipped a tenner in with the Christmas socks this year, you’ll do far worse than picking up a copy for yourself. I enjoyed this review. The title grabbed me, and I am delighted to see it is a quirky as it promises. I am tempted... Thank you for the cheerful review! And in fact I have bought a copy- but it as availible from Amazon.co.uk, unlike the review reported. Thanks, Kate, I think Future Fire found it on Amazon.co.uk after I'd searched and failed.